In the latest episode of EMDUG Live – new Pads, iOS 7, and special guest Stan Skrabut show’s us Evernote. Posted in EMDUG, Extension Service, Personal Productivity. Posted in iPad, Personal Productivity. Posted in iOS, iPad, iPhone, iTouch, Personal Productivity, Tutorial. In a prior post, we addressed the similarities and differences between a laptop computer and an iPad, and whether could replace one with the other. 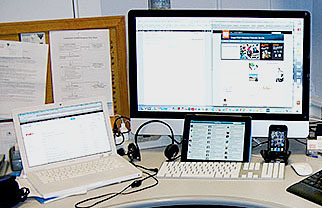 While there are people who have gone to one device, most of us use multiple devices and jump back and forth between them. Recent research from Google has discovered that “90% of people move between devices to accomplish a goal.” So not only are we using different computing devices, but using them in conjunction. That means it’s not really a question of either or, but rather what do I want to do and which tools do I use to do it. You can read more about Google’s research on there Google Mobile Ads Blog – Navigating the new multi-screen world: Insights show how consumers use different devices together. Posted in iPad, iPhone, Personal Productivity. Can I Replace My Laptop With An iPad? Ok, so many of you out there might be thinking the iPad would be a great replacement for your laptop. After all, it’s lightweight, has great battery life and does everything a laptop does, right? Well…kinda, sorta, maybe…but not exactly. Let me explain. I too prefer carrying an iPad instead of an arm busting laptop but it has some limitations which are worth considering. Depending on the version, iPads have 16GB – 64GB of total storage capacity. That might sound like a lot, unless you work with many high resolution photographs and/or video files which can quickly eat up drive space. In comparison, laptops typically come with a 250GB – 500GB internal hard drive and are able to hold thousands of files. The iPad comes with a touchscreen keyboard to enter text, which may or may not work for you. It’s usually ok for note taking and short paragraphs, but if you do a lot of typing, you might want to stick with a laptop or get an external bluetooth keyboard compatible with the iPad, at which point you lose some of the portability factor of the iPad, but it’s an option. With a laptop, it’s fairly easy to transfer files. For small files, you can transfer files via email or WiFi and larger files can be sent over an Ethernet connection, burned on a CD/DVD disk, USB flash drive or card. On an iPad, transfers can be a little bit more complicated, especially since it doesn’t have on board Ethernet connectivity or a CD/DVD burner. You can use email to send small files, but for bigger files your options are limited to WiFi transfers, via USB (using the dock connector and iTunes) or using Apple’s IPad Camera Connection Kit which lets you transfer photos and videos from a USB drive or SD Flash card. Another limitation you need to consider is what types of files you use and which software you need to create, read and edit them. Today’s laptops are powerful computers which allow you to use equally powerful programs to create complex content. iPads, on the other hand, have limited processing power and many of the programs that run on a laptop, such as Microsoft Office, are not available for the iPad, although there are 3rd part apps which allow you to view and edit the files, but are still limited in functionality. So, should you replace your laptop with an iPad? If you can live with the limitations, go for it, but for most people, a laptop should probably still be your main computer. 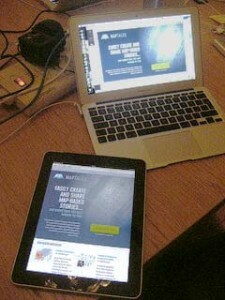 Of course, having both a laptop AND an iPad would give you the best of both worlds – a powerful computer for your heavy duty computing needs and a lightweight tablet computer for emailing and web surfing wirelessly from your couch!